Part 2, June 2005 to December 2015, can be found here. I think she wore it at some event in Stockholm too before her marriage. I can picture it on maybe a white(?) jacket with her standing at attention next to CG. I looks lovely how she wears this jewel in her hair. What material could the petals be made off? Mother of pearl maybe? It would be nice to see this one again. I really like this multcoloured set and it's a pitty that Victoria hasn't worn it in a long time. Or has she? I'm not sure, but it feels as if she has worn the earrings more often then the necklace. It was also a very long tome we say the topaz necklace of Victoria. Such a beautiful set. I love the colors. When was the last time we saw the necklace? In my opinion the multi-coloured necklace, suits better for a young woman, so maybe we will see it on Estelle next time. I have to agree. IMO they are almost a bit costumey. They would look good on someone younger, but the necklace especially would look almost a costume piece on Vic now. Would be lovely on Estelle later. Imo Victoria is still young enough to wear this necklace. I think it's sophisticated enough to be worn at lower profile evening events. 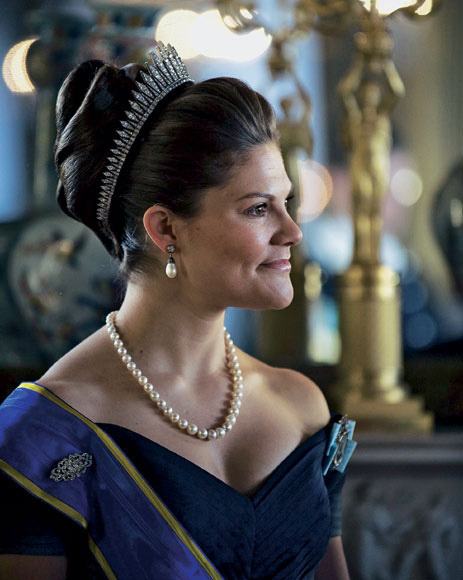 But it isn't the same brooch Sofia wore at the gathering of the Swedish Academy. I think it's two different brooches. On the pic from it looks like it can be split in two clip brooches. On January 27 Victoria wore pearl earrings that look like another item of Kreuger jewelry to me. Probably silver and the typical butterfly from the Kreuger collection just above the pearls.